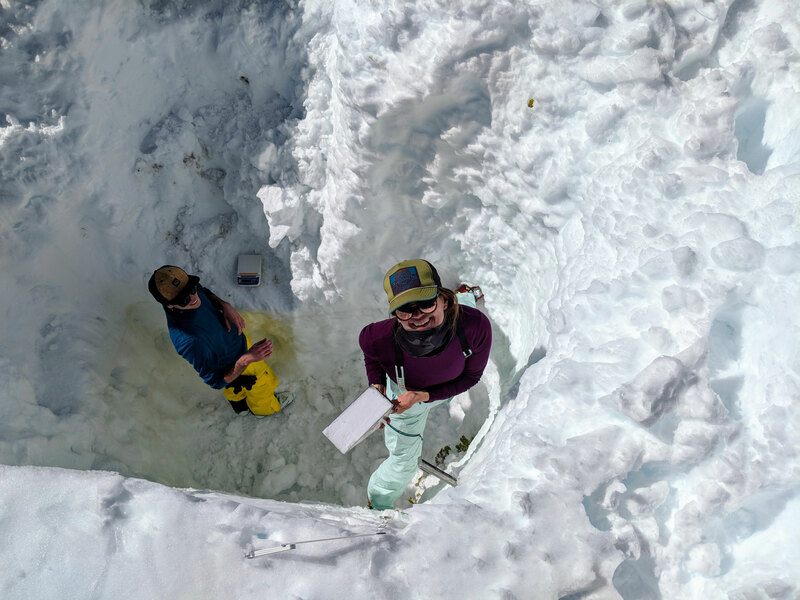 Please join us for a free, educational webinar hosted by the Colorado River District and the Center for Snow and Avalanche Studies on Tuesday, April 2nd, from 12:00 to 1:00pm. “Know Your Snow” will provide important updates on current snowpack conditions, ongoing drought in the Colorado River Basin, threats posed to our water supply by dust on snow, and an overview of changing runoff trends important to water users on Colorado’s Western Slope. As public officials, water leaders and concerned citizens we recognize that you play an important role in educating your communities on important water issues. A view of the upstream side of the dam that forms Wolford Reservoir, on Muddy Creek, a tributary of the Colorado River, above Kremmling. 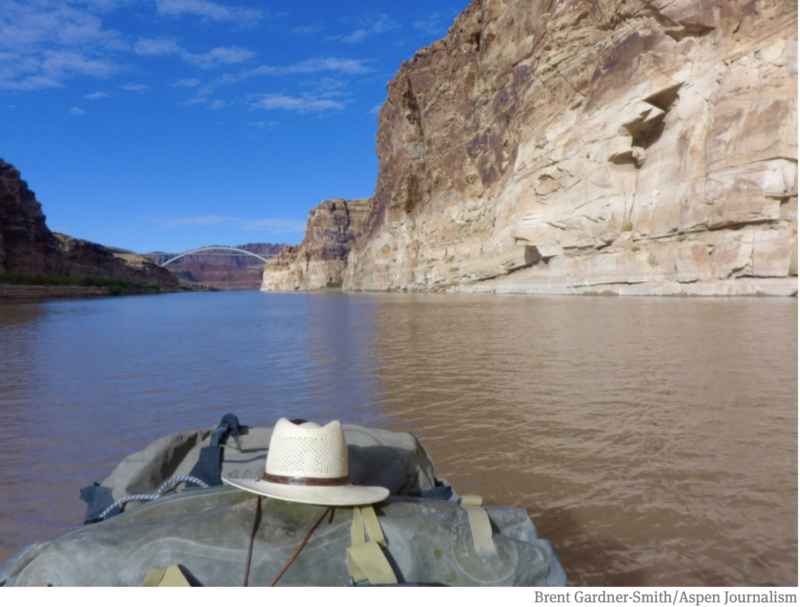 The Colorado River District has 5,000 acre-feet of water in the reservoir set aside for future water sales, but demand for the water has been flat since 2009. 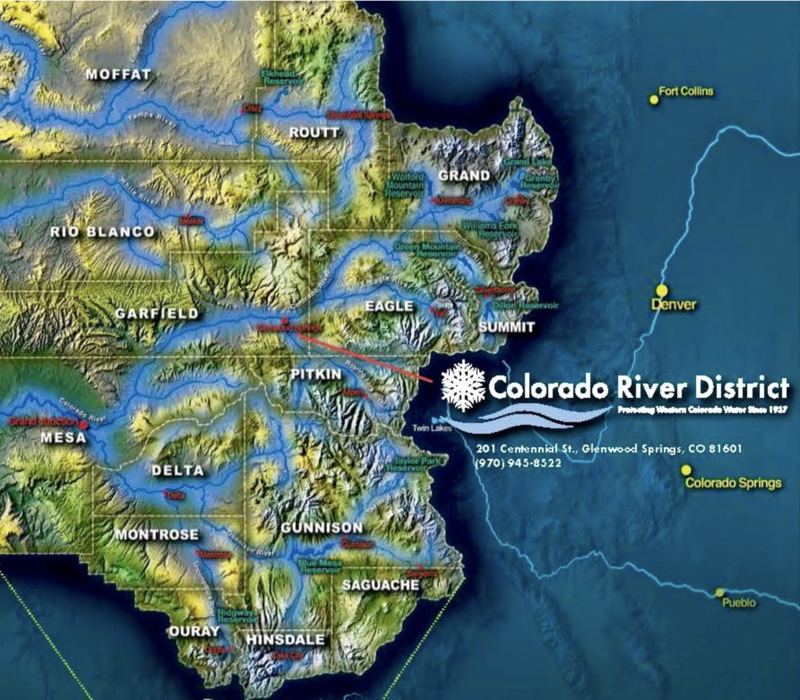 Officials at the Colorado River Water Conservation District say the market for additional water sales to cities and the energy sector from water it owns in four Western Slope reservoirs, including Ruedi Reservoir, is flat or declining. However, the potential to sell water from the reservoirs to increase flows in rivers for environmental purposes holds promise. 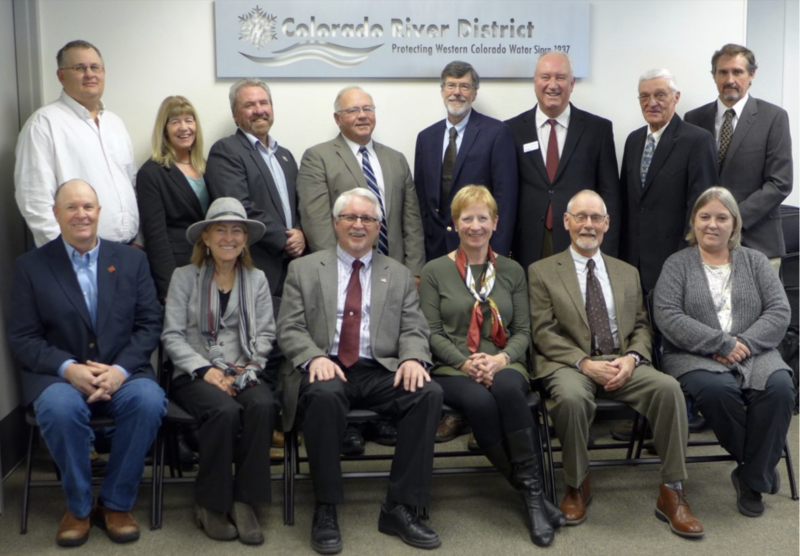 As part of a Feb. 15 workshop on the river district’s financial outlook, which is challenged by the effects of two Colorado laws that put limits on property-tax revenue, district officials briefed the district’s board of directors on the potential to increase revenue to the district from additional water sales. Today, the district’s enterprise fund brings in about $1.2 million a year from the sale of about a third of the 24,400 acre-feet of water it has available for sale in Ruedi, Wolford, Elkhead and Eagle Park reservoirs. But there does not appear to be much future demand for the district’s unsold water. The district owns 11,413 acre-feet of marketable water in Ruedi Reservoir, which holds about 102,000 acre-feet of water behind a dam on the Fryingpan River above Basalt. Today, the district has existing sales contracts to deliver to various customers 5,263 acre-feet of water from Ruedi, leaving 6,150 acre-feet of water available to sell. In Wolford Reservoir, the district has 8,100 acre-feet of water set aside for sales. 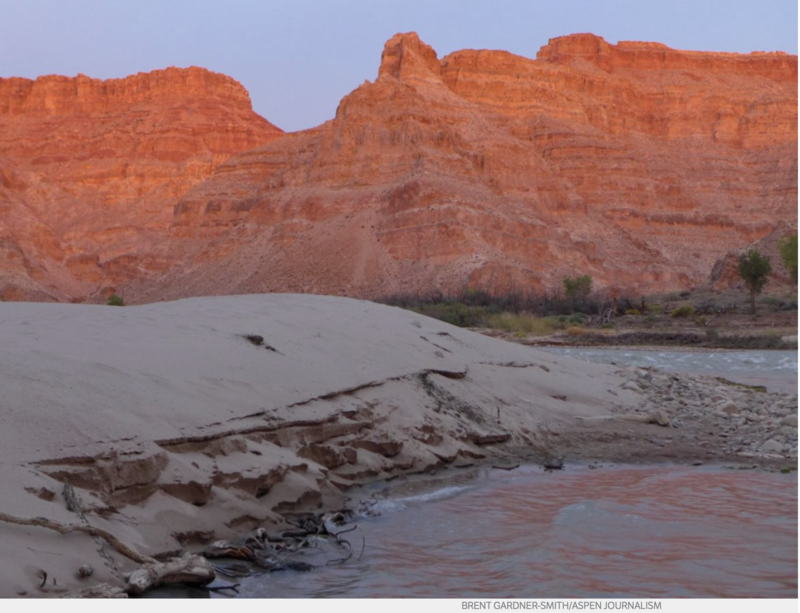 Wolford is owned and operated by the river district and located on Muddy Creek, a tributary of the Colorado River above Kremmling. The district now has sales contracts for 3,038 acre-feet of water from Wolford, leaving 5,062 acre-feet available to sell. In Elkhead Reservoir, on Elkhead Creek, a tributary of the Yampa River near Craig, the district has 4,457 acre-feet of water available for sale but has contracts for only 100 acre-feet of the water. And the district owns 432 acre-feet of water in Eagle Park Reservoir, which is on the upper Eagle River. Of that, 254 acre-feet is under contract, leaving 178 acre-feet to sell. But according to Mueller, Wolford contracts have decreased since 2009 and Ruedi contracts have been flat or decreased since 2013. A recent exception to the trend at Ruedi is a lease for water that the district signed in July with a state agency, the Colorado Water Conservation Board, for $229,000. In exchange for the money, the district will ask the Bureau of Reclamation, which manages Ruedi, to release this year up to 3,500 acre-feet of water from the reservoir. 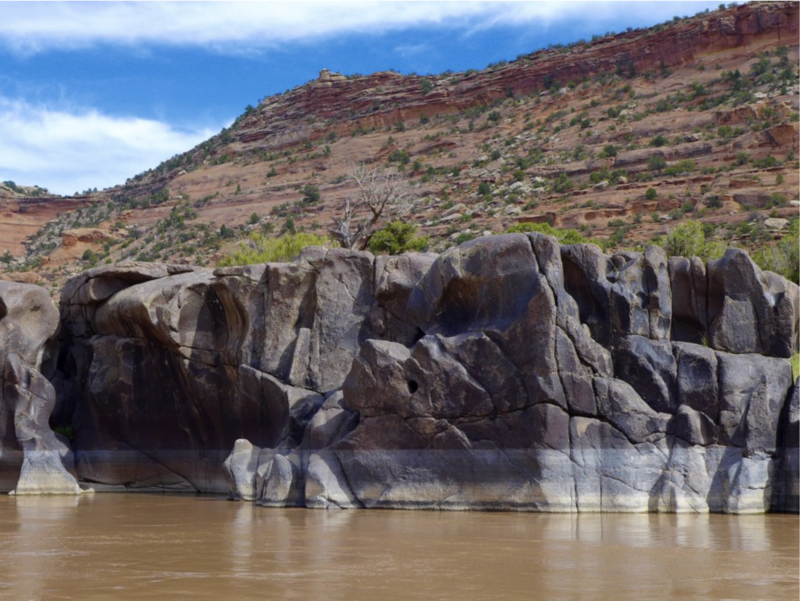 Releases of the water will be timed to boost instream flows in the Fryingpan River during the winter to prevent icing and to increase flows in the Colorado River later in the year to help preserve habitat for endangered fish in the “15-mile reach” below Palisade. (The Fryingpan flows into the Roaring Fork River in Basalt, and the Fork flows into the Colorado River in Glenwood Springs). Tom Gray, who represents Moffat County on the river district board, was bullish on the idea of using water stored in reservoirs to bolster flows in the state’s rivers as an alternative to drying up agricultural fields to do so. Editor’s note: Aspen Journalism covers rivers and water in collaboration with The Aspen Times and other Swift Communications newspapers. The Times published a version of this story on Sunday, Feb. 24, 2019, as did the Glenwood Springs Post Independent and the Summit Daily News. During a five-hour “fiscal workshop” Friday in Glenwood Springs, the river district’s directors reviewed how Gallagher shifts the tax burden away from the growing residential sector to the commercial and industrial sectors, which ends up reducing property tax revenue for the district. And the district gets 97 percent of its revenue from property taxes. Mueller warned the district’s directors about potential “significant harm” to the river district’s revenue stream from the combined limitations of Gallagher and 1992’s Taxpayer’s Bill of Rights, or TABOR, which are made worse for the district by rising residential property values on the Front Range and a sagging energy sector on the Western Slope. The people polled liked what they heard, with 60 percent of people across the district saying they would vote for it, including in Mesa County. And those numbers went up to 72 percent when voters were informed again that the measure did not constitute a tax increase. 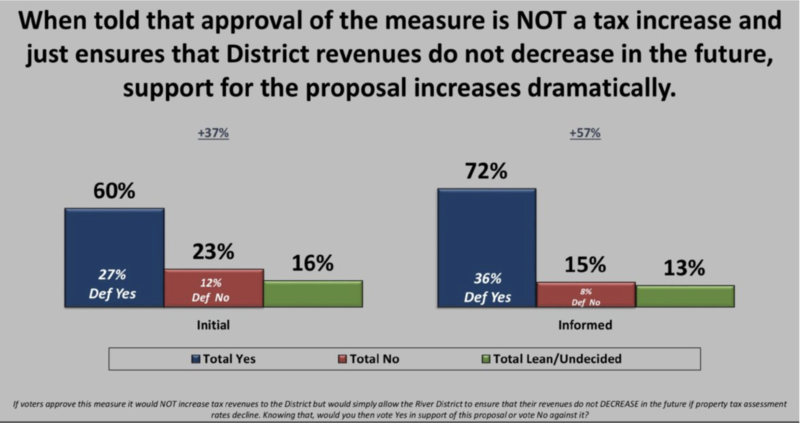 A slide from a survey of 500 active voters in the Colorado River District’s territory conducted between Feb. 7 to 11, 2019 by New Bridge Strategy, about a potential ballot measure that would allow the district to adjust its mill levy to offset the impact of the Gallagher Amendment. The Colorado River flows through the heart of Mesa County and its water makes the Grand Valley green. When the river drops due to drought, as it did in 2002, residents notice. In late 2002, then Republican Congressman Scott McInnis, now a Mesa County commissioner, wrote a letter to editor of the Glenwood Springs Post Independent, supporting the river district’s ballot question seeking relief from TABOR. 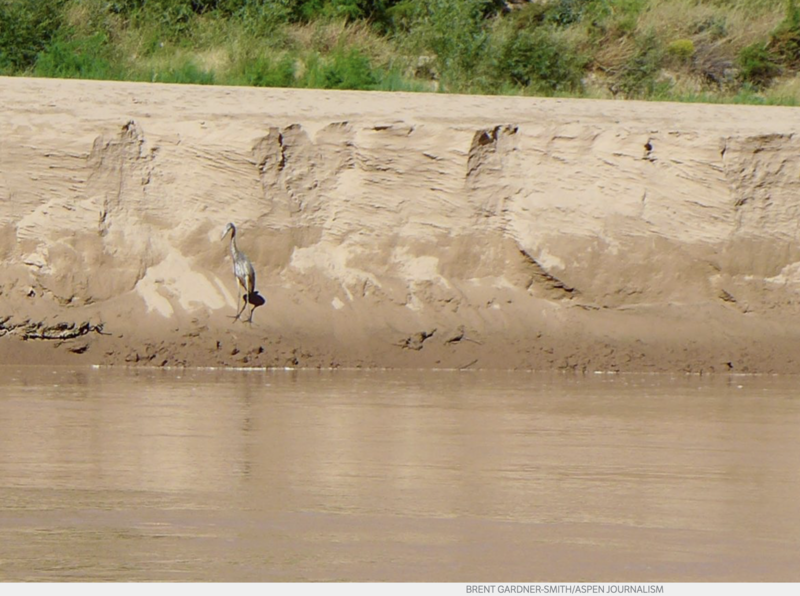 But river district staff members know that the wind can also blow upriver in Mesa County. Editor’s note: Aspen Journalism covers rivers and water in collaboration with The Aspen Times and other Swift Communications newspapers. The Times published this story on Tuesday, Feb. 19, 2018. The Glenwood Springs Post Independent also published it on Feb. 19. The Summit Daily News published the story in its print edition on Feb. 20, 2019. Colorado U.S. Senator Michael Bennet today applauded the groundbreaking of the Fire Mountain Canal Improvement Project in the North Fork of the Gunnison River. “Because our parents and grandparents made necessary investments in water infrastructure, agriculture has thrived on the Western Slope,” Bennet said. “We need to make these same investments for future generations. The demands on our rivers are greater than ever as we face the challenges of climate change and a growing population. Collaborative efforts like the Fire Mountain Canal Improvement project are critical to making irrigation systems more efficient to support our agricultural economy. “Congratulations to all of the local, state, and federal partners who collaborated to make this project a reality. Our work to secure the Critical Conservation Area designation, and federal funding through the Farm Bill, are the first of many actions we can take to invest in Colorado’s water security,” Bennet concluded. In 2014, Bennet secured the Critical Conservation Area (CCA) designation for the Colorado River Basin, making the lower Gunnison basin eligible for federal funding. As a member of the Senate Agriculture Committee, Bennet then helped craft a new Regional Conservation Partnership Program (RCPP) in the 2014 Farm Bill, which secured $8 million for the Colorado River District project in the Lower Gunnison River Basin. In the 2018 Farm Bill, Bennet worked to reauthorize and increase funding for the RCPP and direct more funding toward water infrastructure and drought resilience across Colorado and the West. The $4.6 million Fire Mountain Canal Improvement Project will build a buried, large-diameter pipeline along four miles of currently unlined canal. The project is part of the $50 million Lower Gunnison River Basin Project, spearheaded by the Colorado River District, with combined funding from the Natural Resources Conservation Service, the U.S. Bureau of Reclamation, the Colorado Water Conservation Board, local water conservancy and conservation districts, and local irrigation companies such as the Fire Mountain Canal and Reservoir Company. Here’s the Finding of no significant impact from March 2018 via USBR. A sweeping, multi-entity effort in the lower Gunnison River Basin to boost irrigation efficiency and help the environment is marking a milestone with the start of work on a pipeline project in the North Fork Valley. A groundbreaking celebration Tuesday marked the beginning of the Fire Mountain Canal Improvement Project. The $4.6 million undertaking, which is expected to take two years to complete, is part of the larger, $50 million Lower Gunnison Project. The Fire Mountain work involves converting more than four miles of open, unlined, earthen canal to a buried, large-diameter pipeline. Dave Kanzer, deputy chief engineer with the Colorado River District, which is managing the Lower Gunnison Project, said the Fire Mountain project will benefit some 5,000 acres of irrigated ground. The potential benefits to the Fire Mountain system were made evident last summer when drought taxed its water supply. Kanzer said Fire Mountain is what’s called a “water-short” system. 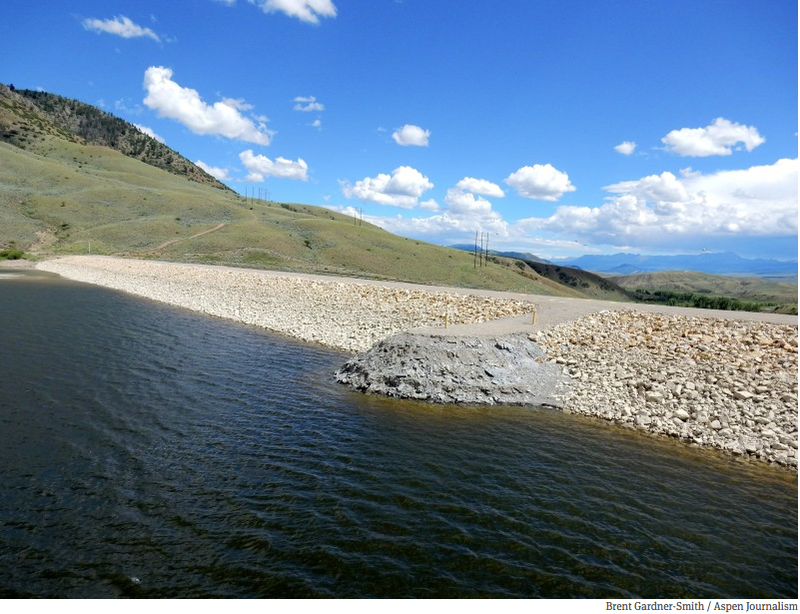 It has a brief, limited water supply season, relying on water from Paonia Reservoir and unable to tap supplies from the Gunnison River mainstem. Kanzer said converting to sprinklers allows for switching to minimum- or low-till agriculture, which allows for carbon capture and accumulation of organic matter in soil, as an alternative to using chemical fertilizers. 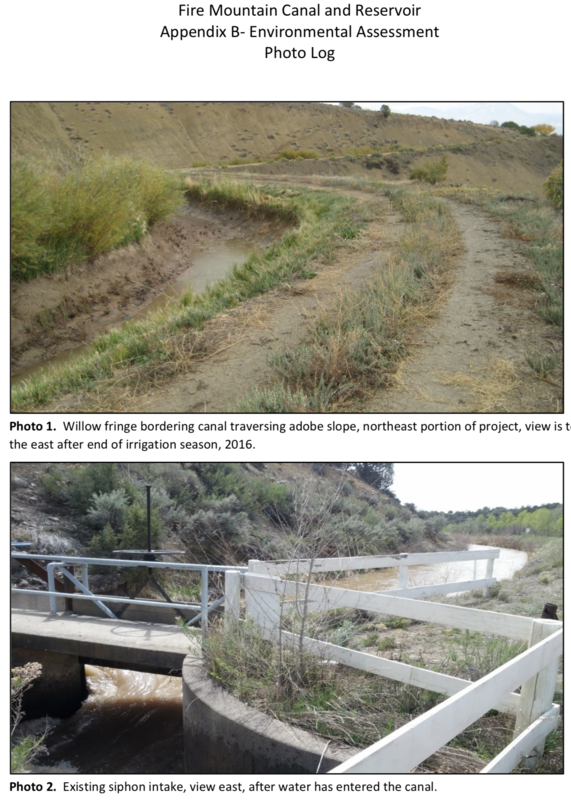 These changes in irrigation approaches also mean less concentration of salts and other chemicals in soil, less salt and selenium in waterways and improved river flows, which benefit wildlife, including endangered fish downstream. While several projects in the lower Gunnison basin have gotten underway as part of the umbrella Lower Gunnison Project, Kanzer said the Fire Mountain project is the first large one. 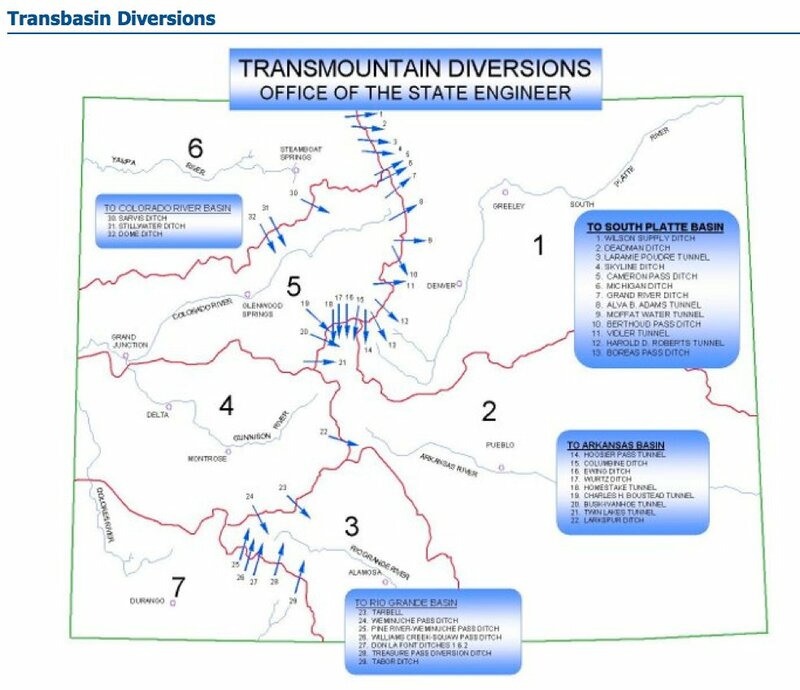 A $5 million pipeline project in the Uncompahgre River Valley also is going forward this year, he said. 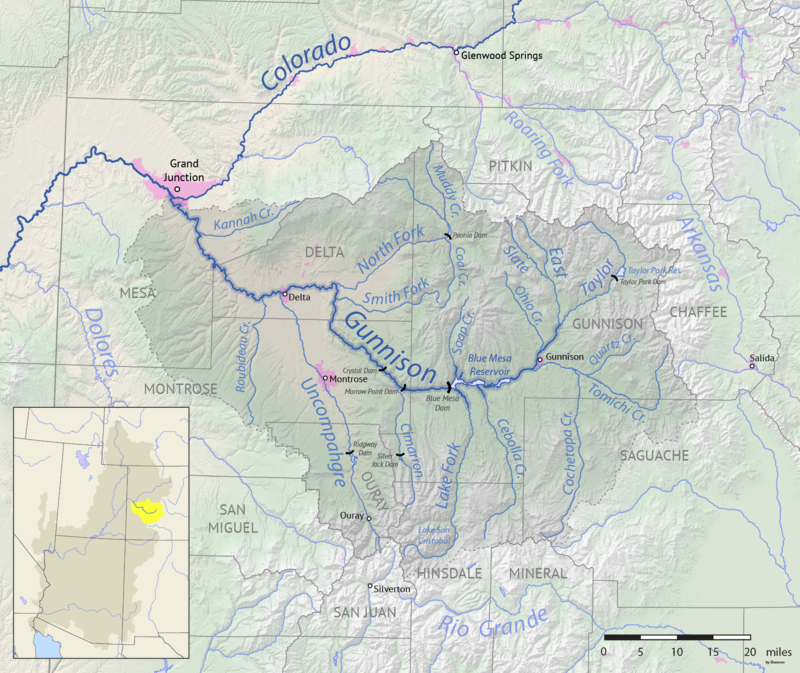 The Lower Gunnison Project incorporates funding from the U.S. Department of Agriculture, the federal Bureau of Reclamation, the Colorado Water Conservation Board, local water conservancy and conservation districts, and irrigation companies including the Fire Mountain Canal and Reservoir Co. The project is the product of a diverse partnership and is focusing on improving agricultural water use efficiency in areas covered by the North Fork Water Conservancy District, Bostwick Park Water Conservancy District near Montrose, the Crawford Water Conservancy District and the Uncompahgre Valley Water Users Association. Lake Powell today is 43 percent full. The giant reservoir formed by Glen Canyon Dam typically receives 10.3 million acre-feet of water flowing into it from the Colorado, Green and San Juan rivers each year. But annual inflows have been less than 5 million acre-feet for seven of the past 18 years, and have been below average for 15 of the past 18 years, according to a summary of recent water meeting at Colorado Mesa University prepared by Ken Ransford, the secretary of the Colorado River Basin Roundtable. Water from the Roaring Fork, Fryingpan and Crystal rivers flows into the Colorado River in Glenwood Springs. That pool of water — a tiny bucket within a very big bucket — is to be filled through a voluntary, temporary and compensated demand management, or water-use reduction, program that has yet to be set up across the upper basin states. “The lack of commitment to the state’s constitution and laws demonstrates its intent to deviate from them should a compact call occur,” Porzak said in his letter. Editor’s note: Aspen Journalism covers water and rivers in collaboration with The Aspen Times and other Swift Communications newspapers. The Times published this story on Tuesday, Nov. 28, 2018.